✔Our products are shipped from US warehouses. ✔If you have any questions, please contact us. We will help you to solve it. If not, we will accept your return or refund. The hammock carrying bag makes it easy to transport your hammock to your destination of choice. This comfortable and fashionable Hammock Stand is your first choice for any indoor or outdoor space. It does not require skills or experience to assemble your hammock stand. Even when you are alone, you can set it up within five minutes. Just hangs your favorite hammock anywhere you'd like, relax and enjoy yourself!!! Maximum Weight capacity: 150 kg/330 LBS. Fit for Double nest & Single nest Hammocks. Nicely look, easy to assemble, portable , stable and weather resistant. Tips: Due to the different weight of the user and the material of the hammock, if your hammock has been used for a long time,the ductility will make it looser, the actual suspension experience will be closer to the ground. 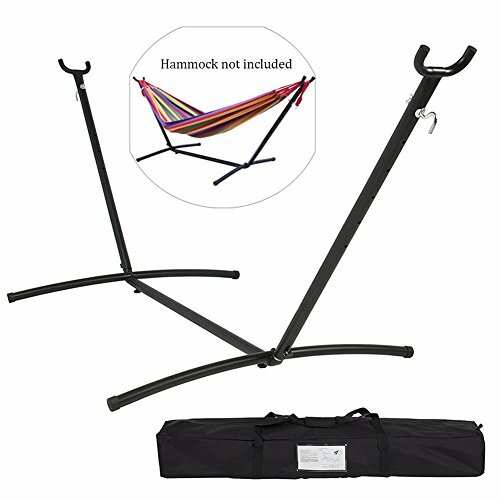 His hammock stand offers the perfect way to hang up your hammock for the ultimate relaxation and is perfect for youth-sized 9' hammocks. Hammock not included. Overall Dimensions:280*118*112cm/10.2*46.5*44 inch,suitable for hammock size 200*150/200*140.Maximum load capacity 150 kg. If you have any questions about this product by NOPTEG, contact us by completing and submitting the form below. If you are looking for a specif part number, please include it with your message.